One of the most important keys to success is none other than your ability to delay gratification. When you push the immediate pleasure and aim for the long-term gain, you set yourself up for success, not now, but in the future. What is delayed gratification? It is the process whereby you resist the immediate reward in preference for a later reward. 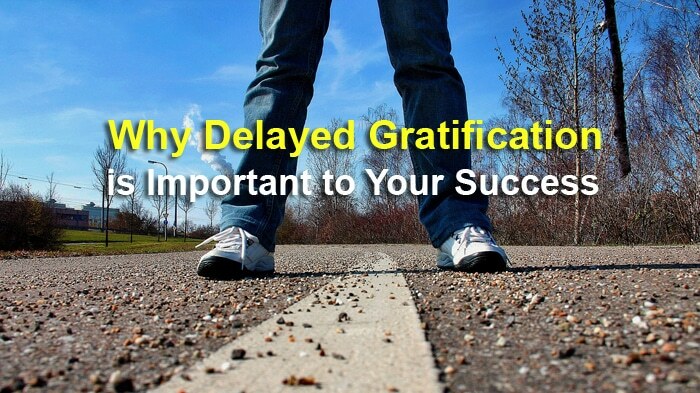 So what does delayed gratification has to do with your success in life? One of the most common reasons people fail to produce outstanding success in life is because they don’t have the willpower or the persistence to press on with what they want. For instance, if you want to exercise for an hour but your favorite drama series is aired at the same time, which will you choose? For those who choose to not exercise and watch the drama, their ability to resist temptation is low. As for those who stick to their plan to exercise to lose weight and to build a healthy body, they have a stronger ability to delay the instant pleasure. I love the book, The Compound Effect, written by Darren Hardy. It is a book that I strongly recommend you read. In the book, Hardy explains why it is difficult to delay gratification and stick to a plan. I bet you have heard about the story of choosing $3 million now or to have 1 penny that doubles every day. While this is an old story, but if you look at the table below, you will understand why it is so difficult for people to stick to their plan and continue to pursue their goals without being affected by other things. Imagine your friend chooses to receive $3 million right now and you choose the other path – the penny doubles for 30 days. On the first day, you have $0.01, but your friend has $3 million with him. He can enjoy and spend the money. He can buy a new car and get whatever he wants. On the fifth day, your friend has his $3 million, but you only have $0.16. This is where you will start to doubt yourself whether you are making the wrong decision. Perhaps, you should choose to have $3 million up front like your friend did, right? On day twenty, your friend still has his $3 million, and your penny only doubled to $5,242.88. After twenty days, you’re just getting $5,000 and it is not even hitting the $10k mark. Can you see why most people give up and fail to stick to their plan now? Even when it reaches day 27, you’re just getting $671,088.64, not even hitting the million dollar mark. And you just have 3 more days to go. And at day 28, this is where the magic happens. Suddenly, the power of the compound effect started to work. On day 28, you will get $1.3 million, and by day 30, you will have $5.3 million, which is more than what your friend gets. Plus, if you give the compound effect another day to work its magic, by day 31, you will have a whopping $10,737,418.24. That’s $10 million, my friend. Such is the power of compound effect plus the ability to resist temptation. You see, in this example, when your friend is getting $3 million but you’re only getting a penny that doubles each day, how do you feel? Most people compare what they do with other people’s results. When they see that other people are doing good, changing a bigger car, moving to a bigger house, etc., they feel dejected. They doubt themselves if they should continue to do what they do. And unfortunately, most people will either choose to do something else or they quit on their goal altogether. My friend, this is why your ability to delay gratification is important. You see, success will not come to you overnight. You will have to work at it day-in and day-out, every day, to produce the results you want, step-by-step. And this is where the problem arises. When you are taking baby steps and making small progress each day, there is no doubt that there are others who have produced better results than you. And when you compare yourself with them. It makes you feel like a failure. The same goes for blogging. While I’m building this blog step-by-step, I see that there are many other people who have made it and earn a lot more in another platform, like e-commerce and affiliate marketing. So that actually makes me feel dejected. But luckily, I know that I’m making progress and as long as I stick to my plan, I can produce similar success in the end. Hence, I choose to delay gratification. I choose to push away all other opportunities that promised me instant-riches. I choose to not buying any new internet marketing courses until I produce the result I want. And this, my friend, is the ability to delay gratification. You resist the temptation that promises to give you instant pleasure and opt for the better and bigger reward later. Nobody can create success overnight. And because success will not come to you instantly, your ability to resist instant pleasure and temptation become vital. In my previous article, I did share about why your ability to delay gratification is extremely important to your success. Plus, in the article, I also shared 7 ways how you can improve your ability to resist temptation, to say no to instant pleasure, and to commit to your long-term goal. If you want to stick to your plan, beat procrastination, and achieve greater success in the future, develop the ability to delay gratification. Choose to resist the instant pleasure and build the self-control to endure the pain right now so that you can build a better future. Yes, choose to do the hard things now so that you can enjoy the easy things in the future. If you choose to do the easy things now, you will have to suffer and do the hard things later. It is your choice, my friend. Choose to delay gratification and always focus on your goals.